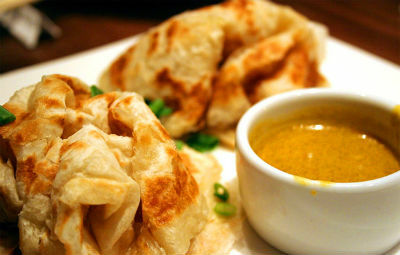 Singapore Roti Prata is similar to South Indian Parota and is served with veg or meat curry of choice. 1. In a large bowl sift together the flour and salt. 3. Add buttermilk and water. 4. Knead well until the dough does not stick to the sides of the bowl and is soft and sticky. 5. Pinch small portions of the dough and roll them into a ball. 6. Apply some ghee on the balls and place them in a bowl. 7. Cover and keep aside for 3 to 4 hours. 8. Flatten each balls on a greased surface and stretch them thinly by pulling at the edges. Add little oil if the dough sticks to the fingers. 9. Fold the stretched dough into a medium size square/rectangle. 11. Cook the squares/rectangles for a few minutes or until brown spots start to appear. 12. Flip the other side and cook for a minute more. 13. Crush the cooked prata, using your palms, to fluff it up and serve at once with side dish of choice. Feel free to comment or share your thoughts on this Singapore Roti Prata Recipe from Awesome Cuisine.